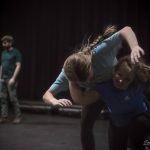 The Ring of Steel Stage Combat Workshop took place Saturday and Sunday, October 13th and 14th in McArdle Theatre. The event was coordinated by Alpha Psi Omega Theatre Honor Society at Michigan Tech to provide an opportunity for its members, Visual and Performing Arts students, and the greater community to learn basic stage combat techniques. The event officially began on Saturday morning with yoga and stretching provided by Ring of Steel’s instructor, Diane. Those that participated in the session were grateful for the chance to stretch before the intensely physical workshops to follow. After stretching, the Falling and Rolling workshop began with discussions from instructor, Maestro Chris, on the “circle of strength” and martial arts influences on achieving believable falls without injuring one’s self. The group then rolled out mats borrowed from Air Force ROTC and practiced basic rolls using the techniques taught by Chris. Other topics that followed included back falls. After Falling and Rolling, the workshop for Hand to Hand combat began with continuation of the circle of strength. In this workshop, partners were necessary and the six levels of safety practiced by Ring of Steel were introduced in order to protect the partner in the exercise. 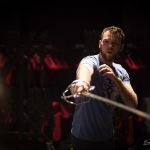 For hand to hand combat, actions such as right hook, undercut, gut punch, blocks, and napping (creating the sound without physical contact with the partner) were displayed with their appropriate safety measures and then practiced in pairs. A sequence was developed in order to create a story and full choreography to practice. 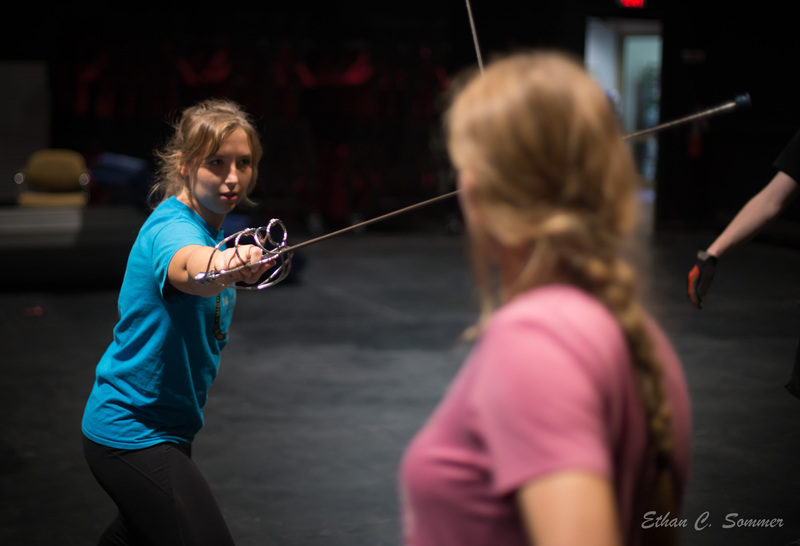 Once participants had been introduced to the levels of safety and basic physical movements, they were able to move on to swordplay. For Saturday, training swords made from plastic or wood-like materials were used when learning the technique and basic movements. Like the hand to hand combat section, a sequence was created to aid in learning and practicing all six levels of safety. The swordplay section ended the long, physical first day for most participants. In the evening of the first day, Ring of Steel gave an after dinner lecture for VPA students with technical theatre and management interest in general stage combat weapon safety, liability, and maintenance. Students were given the opportunity to identify the differences between resin prop and blank firing weaponry and the safety measures that must be in place when using either on stage. Additionally, attendees fired rounds of the blank training weapons to understand the proper etiquette and dangers when handling devices to remember when managing shows involving blank firing weapons. The workshop continued on Sunday with more advanced topics. The morning consisted of review in Falling and Rolling and Hand to Hand Combat with more advanced moves added such as fainting, partner rolls, mid-roll twists to collect an object, weapon disarms, and hair and limb pulls. Following lunch break, a continuation of the sequence learned on Saturday for swordplay was done, this time with steel training rapiers. The group was able to move quickly into the new weapons and was excited to try. After completing the basic choreography set by the instructors, participants were able to then learn the choreography notation in writing and modify the basic choreography to make it unique to each pair. The pairs performed their unique choreography and were critiqued and corrected by Ring of Steel in terms of safety and flow of the movement. The event concluded on Sunday evening with the large group mass battle incorporating all the techniques learned throughout the weekend. Participants further developed their unique choreography and were checked continually by Ring of Steel. Finally, all pairs performed their choreography to the full group and were placed into specific locations on the stage for the mass battle. Many, many practices followed before a clean performance of the full mass battle was done successfully. At the height of the event, eight pairs of unique combat choreography were spread across McArdle Theatre with 4 different cameras catching every moment. Videos of the event will be compiled soon! The event was generously sponsored by the Parents Fund of the Michigan Tech Fund, Public Safety, and Alpha Psi Omega. Special thanks to the Michigan Tech Visual and Performing Arts Department, Air Force ROTC, Trish Helsel, Kent Cyr, Christopher Plummer. Photo Credits to Ethan Sommer, Christopher Plummer, and University Marketing and Communications.